Our 2019 Spring Concert, “Night of the Stars”, is set for Sat., April 20 at 7pm. Click image above to download a PDF flyer. 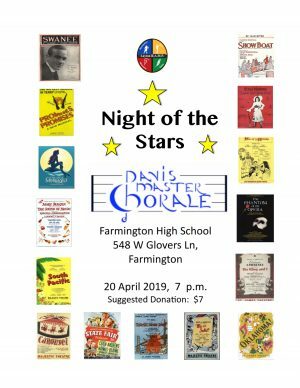 The Davis Master Chorale, with the Davis County Celebration Orchestra, have teamed up to present, Night of the Stars, which is shaping up to be our best concert EVER! 21 show tunes from 15 musicals, orchestra, soloists – what’s not to love? Join us Saturday, April 20 at 7pm in the brand new Farmington High School auditorium, located at 548 W Glovers Ln, Farmington, UT 84025 [MAP]. Suggested donation $7. Part way through the concert we will be announcing the recipient of the annual $1000 Davis Master Chorale scholarship. This scholarship will be presented to a deserving high school senior (or equivalent) that has shown exceptional musical talent with plans to pursue a college degree in music. The funding for this scholarship each year is raised entirely from voluntary donations by the membership of the Davis Master Chorale!